Perhaps the best feature to be introduced in smart phones these days is the ability to wirelessly charge them. Yes, not everyone may agree, but to me it is definitely one of the most important features. Not all phones come with wireless charging built in though, in fact very few do. So when I bought the S4, I was a bit disappointed to realize that it did not come with wireless charging built in like the S3. However, there are ways around it. 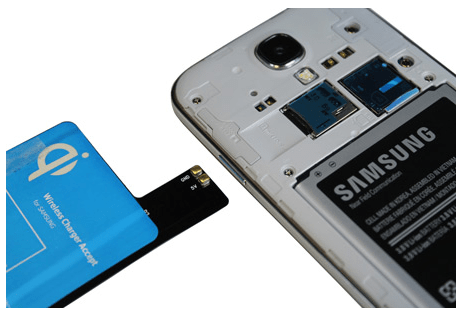 Samsung produce a ‘wireless charging case‘, which we looked at last year. While it works great, it adds a millimetre or so to the thickness of the phone, meaning most cases will not fit the phone, which causes problems of its own, as nobody creates cases that will work with this. There is another way though, and that is by squeezing in a charging pad inside your phone. The charging pad fits over the charging points in your phone, just above the battery, and fits in perfectly within the phone case without adding any extra width, or weight. Perhaps a couple of grams but nothing you would notice. So, this is perhaps the one item you could totally ignore the ‘look and feel’ section on. With the case on, you would not know this existed inside the phone. However, just for the sake of completion, this comes as a small thin pad, as shown in the picture. On the top edge are a couple of contacts, which fit into the section shown below. Once attached, it sticks to the top of your battery, and you will not need to do much more. Put your case back on, and off you go. Simply, the case forces the contacts in place, meaning they don’t pop out. There is also an adhesive which means the pad physically sticks on top of the battery, letting the whole thing stay in place. Is it a tighter fit for the regular case? No, not at all. It works perfectly. Does it work as well as the Samsung Wireless Charging case? As far as I have noticed in the last few weeks of trying it, yes. Wait a minute, what about NFC? Well, okay there is a catch here, and that is NFC. It definitely disrupts NFC. However, very few products actually use NFC, and the ones I come across normally have other ways to pair, for example speakers that will work with Bluetooth. So, this is a winner apart from that? Must be quite expensive then? And yes, it only costs £19.99. 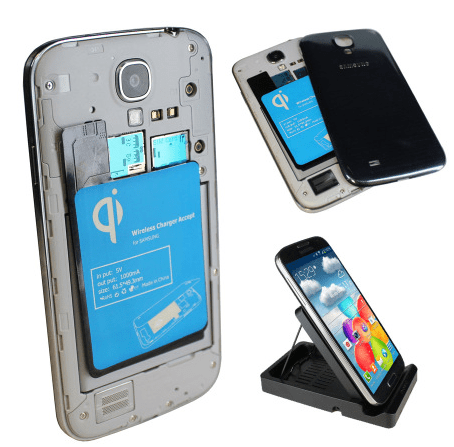 If you already have the Samsung Galaxy S5, Mobile fun have a section of Wireless Charging Accessories for the S5 too. Unless you rely heavily on NFC, which I don’t, and can’t see how many would, this is definitely a win. Great value for money, and fits in perfectly, allowing you to use your standard S4 case.